The notion of Europe is associated with a vast range of intellectual, cultural, and political possibilities. Research on Europe tends to invoke biases and a high degree of ideological reductionism that undermines efforts to pursue nuanced and productive forms of reflection. The conference organisers ask whether there is a way of approaching the essence of the European character without reducing the discussion to essentialism. Is there a way of navigating the mazes that separate questions from answers when we think about Europe? The aim of the international conference, Ideas of Europe / Ideas for Europe, is precisely to map a better and deeper understanding of Europe, without relinquishing reasoned discourse and ethical dialogue. The conference will address the double meaning of its title, bearing in mind that the object of reflection intersects with multiple fields of theoretical representation. We thus ask the speakers to centre their analyses on the following five panel topics. 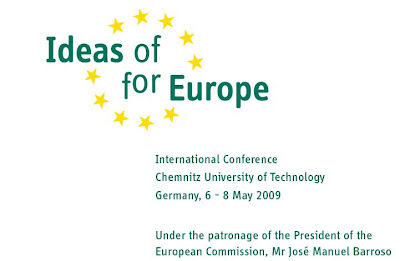 The conference will take place in Chemnitz, 6-8 May 2009, under the patronage of the President of the European Commission, Mr. José Manuel Barroso. Mr. Barroso will officially close this conference. What was the conceptual status of “Europe” prior to modernity – i.e. during Antiquity and the Middle Ages? How were ideas about Europe shaped and what was the geographical understanding of Europe’s place on the globe? How did the thinkers of modernity conceive of their own European identity and of the historical and spiritual implications of such a profound shift in the European mentality? What were the implications for European identity and for the future during the period that stretched from the hopeful Enlightenment and the twilight of rationality to the planned hubris of the Holocaust? For centuries, Europe was dominated by an internalised law of expansion, aiming to replicate itself in vast areas of the world. How has Europe tended to be seen by peoples on other continents? Vacillating between constitutional designs, along the lines of long envisioned European Federalism, and demands for devolution and national identity - what are the prospects for the European future in a world subject to global hopes and even more widespread fears and imminent dangers?